Homebuilding Is Booming, But Skilled Workers Are Scarce More than 2 million construction jobs disappeared during the economic downturn. But now that there are indications the sector is rebounding, the industry is actually experiencing a labor shortage in many parts of the country. New homebuilding reached a 4 1/2 year high in December, welcome news for an industry that lost 2 million jobs during the downturn. Despite those job losses, the sector is experiencing a labor shortage in some parts of the U.S. 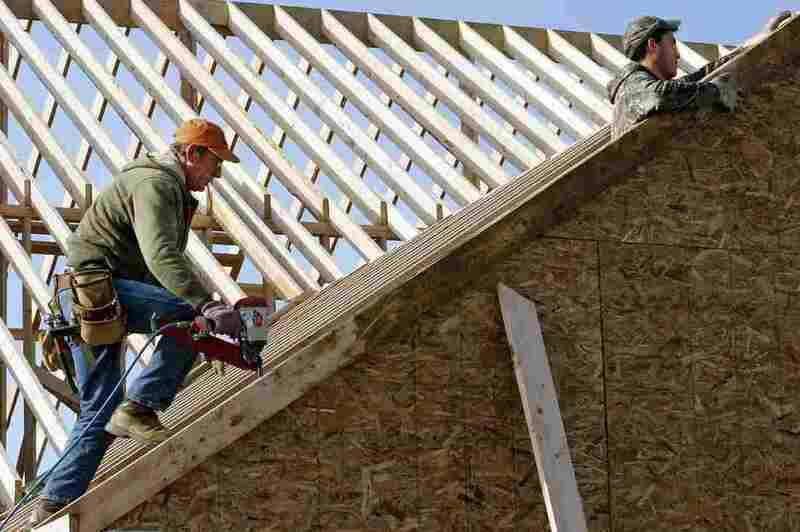 The construction industry in the U.S. is staging a comeback. In one indicator, the Commerce Department announced Thursday that new homebuilding has reached its highest level in 4 1/2 years. While that's a promising sign for the industry, more than 2 million construction jobs have been lost in the sector since employment hit its peak. While some might expect that means plenty of people are ready to fill the new jobs, many markets around the country are actually experiencing a shortage of construction workers. When Debbie Bowman left the Army three years ago, she decided to prepare herself for an eventual turnaround in homebuilding. The Floridian enrolled in a program with the Home Builders Institute to train to become an electrician. "When the economy picks back up, people are gonna buy houses, and everyone needs an electrician," Bowman explains. Indeed, across the country, there is plenty of demand for people like Bowman, says David Crowe, chief economist for the National Association of Home Builders. Decades ago, Holland says, unions trained workers in the trades — skills like plumbing or electrical wiring. But now, companies typically rely on independent contractors — and the companies themselves are reluctant to invest in worker training. "People have completely abandoned any notion of true workforce development," Holland says. "On the professional level, people are thinking about their team, and recruiting and hiring practices and all things that any good businesses have to hold very dear to their heart. [But] those things just don't exist in the craft world." And the whole industry, and eventually consumers, may pay the price for that, Holland says. "If all of [a builder's] subcontractors go up 10 percent, then the cost of the house has to go up," Holland says. "It's not because of higher quality; it's purely because of supply and demand. "So we'll have less good workers, less quality — but higher prices because of it," he says. But builders don't always have the flexibility to pass those higher prices along to their customers. Jan Maly, CEO of a specialty contractor in Houston, says finding skilled labor is his No. 1 problem. He pins much of the blame on the fact that young workers aren't coming into the field to replace all the boomers who are retiring. He says that's due to a cultural and political bias in favor of sending all kids to college, and that there's a stigma against blue-collar work. "My father used to tell me, 'You gotta go to school [or] you'll be a ditch digger,' " says Maly. "Well, right now we need ditch diggers." Maly says many people don't make even the first-round cut of passing drug and criminal checks, let alone bring the skills necessary to do the job. Maly says competition for local workers is reaching a fever pitch, in part because Exxon Mobil is building a massive new headquarters in the Houston area. It costs Maly's company $10,000 to train each new worker, and frequently, when labor is short, poaching becomes a big concern. "It probably means somebody's gonna try to steal our folks," Maly says. For now, he hopes he can hang onto his quality people — and that they will refer other workers to fill his ranks.